Wow – short on the soundcloud and bandcamp tracks this week but there’s nothing in that, just the way this weeks particular cookie crumbled. After 20+ years of 9pm Stinky Grooves it will probably take a few weeks to bed the new times in and see what kind of show emerges, I’m as curious as you are, maybe more. 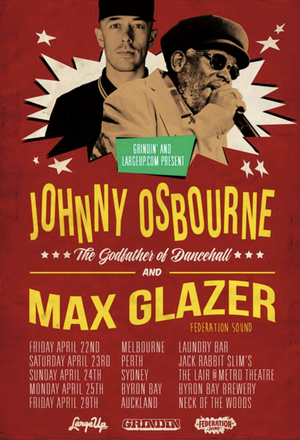 Of course this week’s big hooha is Johnny Osbourne and Max Glazer at the Neck Of The Woods with support from Silva, FJ, Israel Starr, Dubhead and myself. As I understand it Dub and myself will be kicking things off from 10 with Israel Star putting in the mic hard yards. Seriously not one to miss, have to confess I don’t think I’ve seen Mr Osbourne play since the dim and distant 80s but he was wicked then, and I have little doubt that will be very much the case on Friday, them lungs is lifetimes business. I’ll also be spinning at Verona beforehand till 9, followed by the inestimable Manuel Bundy. See you round the traps. thanks for the lines, sorry the new time slot isn’t to your pleasure geez. for what it’s worth it was my choice to be able to do the show with more energy.forwards ever, backwards never…still stinking.